This accelerated course is designed to help you to meet the challenge of assigning Evaluation and Management (E/M) codes quickly and accurately for professional and facility billing. Begin with the basics and learn code assignment step-by-step in just six lessons. Very little coding knowledge is required, just a working knowledge of medical terminology. Coding of Injections and Infusions can be challenging for novice and experienced outpatient coders alike. Get foundational and advanced Injections and Infusions coding training with the Complete Injection and Infusion Coding for Facilities: From Beginner to Advanced! Purchase Injection and Infusion Coding for Facilities and get a free CPT® Coding Injection & Infusion Pyramid — a simple tool, but so powerful! Injection and Infusion Coding for Facilities explains I&I coding in a step-by-step process to ensure accurate coding of services provided in Oncology Units, Infusion Units, and Emergency Rooms. 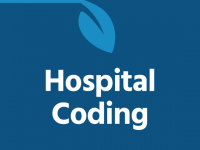 One of the most demanding aspects of outpatient coding is the selection of injection and infusion (I&I) codes. As the sequel course to Injection and Infusion Coding for Facilities, Advanced Injection and Infusion Coding for Facilities describes the more complicated scenarios encountered when coding injections and infusions. One of the most demanding aspects of outpatient coding is the coding of injection and infusion services. 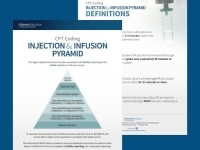 The CPT® Coding Injection & Infusion Pyramid is a two-sided, laminated flashcard providing both the hierarchy rules associated with facility reporting of the initial injection or infusion service, as well as the definitions of the most important concepts of I&I coding — all in a handy, easy-to-use format. Libman Education’s CPT® Update for FY 2019 provides a systematic and comprehensive approach to learning. CPT® Update, by nationally recognized coding expert Gail I. Smith, provides thorough preparation for the important coding changes effective January 1, 2019. Learn from Lynn and Gail! Master the FY 2019 ICD-10-CM and CPT® code changes. This discounted bundle of ICD-10-CM Code Update and CPT® Code Update offer detailed explanations of complex coding concepts from nationally recognized coding educators Lynn Kuehn and Gail I. Smith. FY 2019 Coding Updates contain detailed explanations of critical changes to the ICD-10-CM, ICD-10-PCS, and CPT® codes and guidelines. Learn what the changes mean and how to apply them.